Can Goldfish Live in a Bowl Without a Filter? A goldfish can live in a bowl without a filter, but not at the optimal quality of life. The bowl with no filter arrangement will likely shorten the goldfish's life. 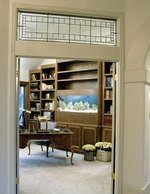 Aquarium experts recommend that you not keep your goldfish in a bowl, but rather a larger, filtered tank. Goldfish take in air by processing the oxygen in water through their gills or by rising to the surface of the tank and taking air in by mouth. 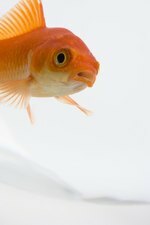 In a tank without a filter, the fish must overly rely on "mouth breathing," which is much more stressful to the goldfish and will likely shorten its life. Filters are relatively inexpensive, starting at under $5, so a simple filter for your goldfish bowl is well worth the money. 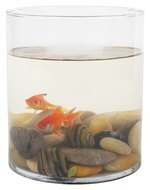 Goldfish generally require more space and water than is provided by a bowl. There's a simple formula to measure how much water your fish will need: For every inch of fish, you need one to three gallons of water. Bowls are generally too small to accommodate a goldfish. If you're looking for a fish that will thrive in a bowl, consider the betta family. If you must put your goldfish in a bowl, fill the bowl only three–quarters full -- to the widest part of the bowl -- to maximize the amount of water surface area. This will help the fish take in oxygen. It's best to keep your goldfish in a filtered tank. The size of the tank should follow the "one gallon of water for every one inch of fish" formula. Although goldfish can adjust to most temperatures, the water in the tank should be kept at a relatively cool temperature -- 60 to 75 degrees Fahrenheit -- for optimal health. One inch of artificial gravel in the bottom of the tank will help keep the tank clean. Avoid live plants as some of them can contain snails, which are notorious bacteria spreaders. Goldfish are dirty, so a regular part of goldfish maintenance is to regularly clean their tank. Every four or five days replace 25 percent of the water -- replacing more will remove the beneficial bacteria that's in the old water. Use bottled water or tap water that has been treated with a conditioner and left to sit for 24 to 48 hours. About once a week take the fish out of the tank and do a thorough cleansing. To do this, wipe the tank with a soft cloth and hydrogen peroxide.